Amdro Kills Ants Stakes - Ant Killing Bait can be used to treat a wide variety of ant species, including: acrobat, big headed, argentine, ghost, crazy, cornfield, little black, pavement, and odorous house ants (not fire ants). They can be easily used outdoors. Simply push them into the ground in semi-soft soil. To use indoors, just lay them flat inside cabinets, behind appliances, or wherever you see ants. Once the stakes are in place, they attract scout ants, which will carry the bait back to the ant colony, where they will share it with the other ants, including the queen. When the queen dies, the colony dies as well. Always be sure to place Amdro Kills Ants stakes in areas that are not accessible to children or pets. Use the stakes inside or outside the home. For continuous control, replace indoor stations after three months and outdoor stations after six weeks. Prevent ants from entering home by removing food such as crumbs, grease, and sugar. Took care of ant problem. But needed a couple weeks to work thoroughly. It’s been over a month, and no little black ants have returned to invade my garage doorway. There are no directions on how to activate the Amdro Kills Ants Stakes. Is it ready to use? Does something need to be opened or punctured? The Amdro Kills Ants Stakes - Ant Killing Bait are ready to use. There is no puncturing necessary. Are the Amdro Kills Ants Stakes toxic? 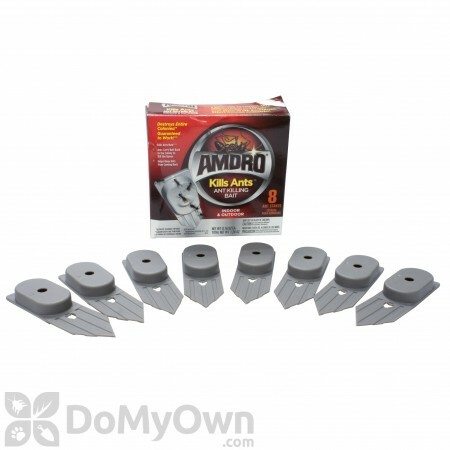 Amdro Kills Ants Stakes - Ant Killing Bait are safe when used as directed on the product label. Is the Amdro Kills Ants Stakes a carbohydrate (sweet) bait or a protein bait, or both? Amdro Kills Ants Stakes - Ant Killing Bait contains a liquid bait which is more sugar/carb based than protein/fat. Is the Amdro Kills Ants Stakes toxic to my dog? Per the product label, the Amdro Kills Ants Stakes should always be kept out of reach of pets and other nontarget animals. We apologize, but we are not able to give medical/veterinary advice. If you believe your dog has ingested the bait, you should contact a vet or pet poison control as soon as possible. You will want to have the product SDS on hand.